What is creativity? What is needed to create? Can the creative process be audited? This Wednesday the exhibition ‘Ferran Adrià. 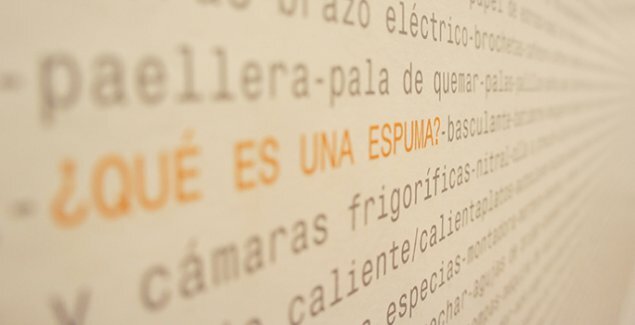 Auditing the creative process’ will open at the Espacio Fundación Telefónica, the first exhibition to analyse the chef’s creative processes. You can visit the exhibition from 29 October 2014 to 1 March 2015. Three years after closing elBulli, after elevating gastronomy to its highest level through his innovative techniques, the award-winning international chef reveals his creative process and the keys to the success of the restaurant at Cala Montjoi in his biggest exhibition to date. The exhibition features captivating audiovisual projections and animations that help dissect and interpret this creative universe and invite the visitor into the chef’s mind. The exhibition’s format also includes artistic installations that acknowledge the network structures of his great friend and precursor to British pop art, Richard Hamilton, who never missed the opportunity for a gastronomic rendezvous at Cala Montjoi. To make the exhibition a reality, a multidisciplinary team has worked for over a year to recreate this creative universe, under the coordination of Adrià himself and a team from Fundación Telefónica. The maps created by Bestiario, a company specialising in data visualisation; the design of the exhibition by Olga Subirós, a creative campaign by publicists Toni Segarra and Jorge Martínez and the website developed by Mario Toscón (Prodigioso Volcán) all invite us to discover not only the exhibition but also creative processes in general, with interviews and culinary challenges on the social networks. Subirós has been tasked with arranging the exhibition’s more than 1000 exhibits over the 1000 m2 of the Espacio Telefónica. The Instagrammers Gallery of Madrid is participating to this project with the competition #VeoCosas_Adria , which invites Instagram users to show their creative abilities through mobile photography. In 1987, the chef Jacques Maximine provided a definition of creativity that was to change the philosophy of Ferran Adrià and elBulli forever: “creativity means not copying”. From that moment on, Adrià decided to distance himself from the masters to forge his own culinary language and set off on a career of unprecedented gastronomical innovation that would lead to elBulli being considered the best restaurant in the world. It rethought established limits. Why can’t ice cream be hot? Who says you can’t mix sweet and savoury? Out of this came the image that was chosen to represent the exhibition, a drawing he made of the word WHY? After 25 years, elBulli closed its doors in 2011, but its work continued through elBullifoundation, dedicated to investigation and ongoing experimentation in the field of cooking. They have come up with a “formula for creativity”, taking elBulli as an example, which aims to serve as a model for other disciplines. They specify that this is not a unique model, but a valid model for improving the output and efficiency of a business, company or office. ‘Ferran Adrià. Auditing the creative process is the first result of the work of elBulliDNA, a multidisciplinary team of some 10 people who, from their headquarters at elBulliLab in Barcelona, study and decipher the creative process, and who will maintain a dialogue with elBulli1846 in Cala Montjoi. Adrià has drawn a map of the creative process, which represents the floor plan and is revealed through the different exhibition spaces. The visitor will therefore discover, step by step, the variables elBulli considers relevant for the process. Using a compass and the quotations that accompany each of the exhibition spaces, visitors will discover the pieces that make up the puzzle of the creative process. What made elBulli run like clockwork? The visitor starts to enter the elBulli universe and, by means of a three-metre mural, journeys through some of the restaurant’s most emblematic moments and objects, from the uniform of the staff, the cushions that decorated the restaurant, emblematic magazine covers, and the dog, the symbol and logo of the restaurant. “It’s not my team, we are a team” is a sentence that those who know Adrià will have heard him say on numerous occasions. Thousands of chefs have ascended the winding roads of Cala Montjoi to work 16 hour days, day in, day out, and that is only achieved with the passion of a team of people. A visual timeline shows the organisational, economic and staff changes throughout the restaurant’s 25-year history. At elBulli 1846 dishes were served over 25 years. Every year, around 5000 experiments were carried out in the workshop, as if it were an R&D department, and only around 125 ideas were eventually included on the menu. In the exhibition, a large table is devoted to the process of creating this dish, where you can observe the methodology and even the tools used, step by step. What is a creative technique? Is inspiration from nature a creative technique? For Ferran Adrià it is. Creativity was elBulli’s raison d´être. Dishes were designed to conquer and surprise the diner through the senses, emotions and intellect, as shown in the exhibition through audio-visual installations, display cabinets and original drawings by Adrià himself. The introduction to creative techniques is a structure that pays homage to Richard Hamilton, made up of black and white photos of elBulli’s creative moments. The will to learn and share has always been part of elBulli’s DNA. A culture of secrecy was never part of its plans. Each year, everything that was created was exhaustively catalogued and preserved: this was done differently each year to avoid monotony: sheets, documents, drawings, graphics; whether hand drawn, computerised or as videos. This systematic record of every step of elBulli’s creative process forms the basis from which the creative audit can be carried out. Through 114 drawings, Adrià reflects on the origins of cooking up to the present day. Timelines of culinary theory and evolutionary analysis, among others, help to explain the difficult task of cataloguing elBulli that began in 2001. What is cooking? After dish number 1846, which also happens to be the year Auguste Escoffier, considered the father of chefs, was born, elBulli started to work on ‘D-Coding’, or the Map of the Gastronomic Process. This diagram shows all the elements, steps and agents involved in preparing a dish, from obtaining produce, the tools and techniques used to cook, the people who would make and serve the dish, up to the moment it was tasted. Images of the exhibition, click here. Making-of video of the exhibition, click here.